President Trump meets with North Korean leader Kim Jong Un on Sentosa Island in Singapore. The Korean Central News Agency (KCNA) reported that Kim and Trump agreed that "it is important to abide by the principle of step-by-step and simultaneous action in achieving peace, stability and denuclearization of the Korean Peninsula." That would go against what the Trump administration has said so far. Last month, Secretary of State Mike Pompeo told the House Foreign Affairs Committee that "the model that we have laid forth is a rapid denuclearization, total and complete, that won't be extended over time." 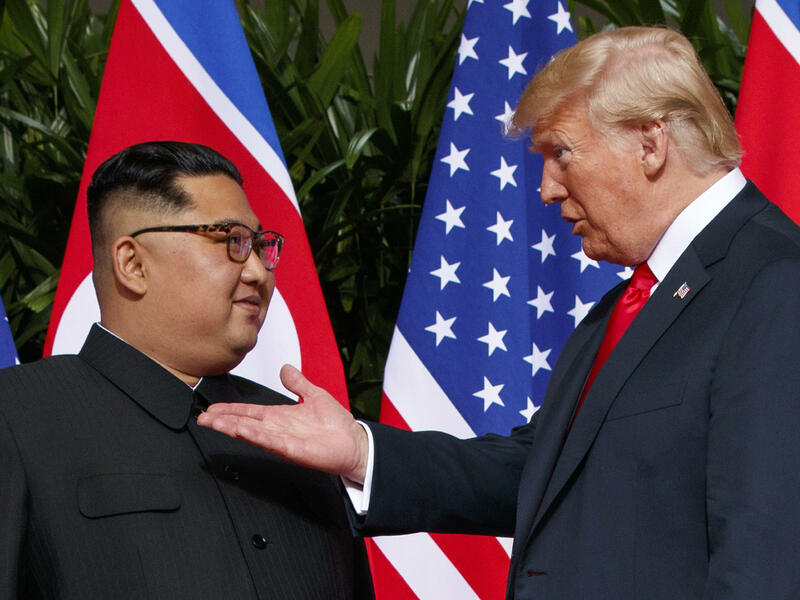 The administration's argument is that the incremental approach used by past administrations has allowed North Korea to extract rewards and incentives from the U.S., only to ultimately renege and refuse to give up its nukes. The KCNA report — which was also carried by the Rodong Sinmun, official newspaper of the ruling Workers' Party — also claimed that the president pledged to suspend military drills with South Korea, and lift sanctions on the North. Trump's comment on suspending joint exercises with Seoul have caught South Korea's Defense Ministry and U.S. forces in Korea off guard. Neither the issue of military drills nor lifting sanctions was mentioned in the statement. In his media briefing in Singapore on Tuesday, Trump mentioned ending the drills, which he described — in language similar to that used by North Korea — as "provocative," saying it would save the the U.S. money. "The sanctions will come off when we are sure that the nukes are no longer a factor," Trump said at the briefing, adding, "I hope it's going to be soon." Neither side has spelled out exactly what those guarantees might be. But Lu Chao, an expert on North Korea at the Liaoning Academy of Social Sciences in northeast China's Shenyang city, says the guarantees are probably "a repeat of previous U.S. statements that it does not seek to overthrow the current regime in North Korea." All of the concessions KCNA claims Trump made are also things China has said publicly it wants. At a routine media briefing on Tuesday, Foreign Ministry Spokesman Geng Shuang welcomed the summit's achievements. "Sanctions are not an end in themselves," he said, "the Security Council, through its actions, should support the current diplomatic negotiations." Shi Yinhong, an international relations expert at People's University in Beijing, said Trump's pledge to halt military maneuvers is, from China's perspective, almost "too good to be true."